. : Home : Patent : Why : How does it work : Download : Contacts :.
.: Photo : Awards : Video : Donate : Link :. Our work continues with the project LIFE-SAVE (Solar Aided Vehicle Electrification), within the European program LIFE, with four industrial partners. Last advances and news at the new website. FILL UP WITH THE SUN! How to convert your car into a green and hi-tech vehicle, cutting off fuel consumption and emissions, and without getting poor? Keeping all the advantages and the range of your car, but recharging the battery with the sun? And without sacrificing performance, but rather adding two electric motors that recover braking energy and transforming your car in a four wheel drive? The project HySolarKit, proposed and patented by researchers from eProLab at the University of Salerno, aims to develop an after-market kit to convert a car into a Hybrid Solar Vehicle, reducing fuel consumption and emissions. The kit, already applied on a FIAT Punto, can be applied to every front drive cars, at a fraction of the investment cost with respect to buying a hybrid car (and with an extra free solar recharge...). Studies on Hybrid Solar Vehicles have been presented worldwide at numerous conferences and seminars by the researchers of the University of Salerno. Documents and papers available at this page. Increasing CO2 impact on Global Warming, instabilities and growth of oil price, depletion of fossil fuels: these are some of the reasons for looking for alternative solutions to personal mobility issues. The motivations toward this projects are presented at this page. The industrial development of the HySolarKit project is fostered by eProInn (Energy and Propulsion Innovation), a spin-off company of the University of Salerno. eProInn srl (www.eproinn.com) is looking for a scientific and technical partner for the following task: 'R&D support in simulation modelling and tests on human vehicles interface and control system'. The scope of the activity is the assistance in development and validation of mathematical models for model based control of a solar-hybridized vehicle. Details at the link http://www.hysolarkit.com/doc/Open_Tender_eProInn_1.pdf. The Rector of the University of Salerno prof. Aurelio Tommasetti has inaugurated the L7 building, an incubator for the spin-off companies of the University of Salerno, awarded with the LEED Platinum label due to its advanced features in terms of sustainability.Some pictures and a map are available at this page. The Newsletter#33, in Italian and English, has been distributed to over 23000 contacts. At this link. A video from RetroTV on the projects presented at the "Green Tech Innovators Club", hold in Graz, Austria, on October 17, 2017, is now available. At the 2017 Edition an Italian project has been also invited. The interview to #HySolarKit is at this link. Just after the meeting with investors at the Green Tech Innovators Club in Graz, we will fly to Bruxelles to partricipating in the LIFE Kick-off meeting. Our project SAVE (Solar Aided Vehicle Electrification) has been selected among 8 projects particularly "Close to market", to be presented to a pool of potential investors on October 18. A newsletter has been sent on September 23rd, 2017, with a new responsive format, to more than 23000 contacts. Topics: LIFE-SAVE Project Approved: a good time to invest in this project! - HySolarKit at Green Tech Cluster in Graz - All videos on HySolarKit. At this link. On October 17th, 2017, the project of converting conventional cars in hybrid solar vehicles will be presented to potential partners and investors in the meeting og Green Tech Innovators Club, in Graz, Austria. The Green Tech Cluster is a very active institution in Green Innovation. It is located in Styria, a region characterized by a very high concentration of innovative companies and a strong tradition toward inventions, proved by scientists as Nikolas Tesla and Viktor Kaplan. 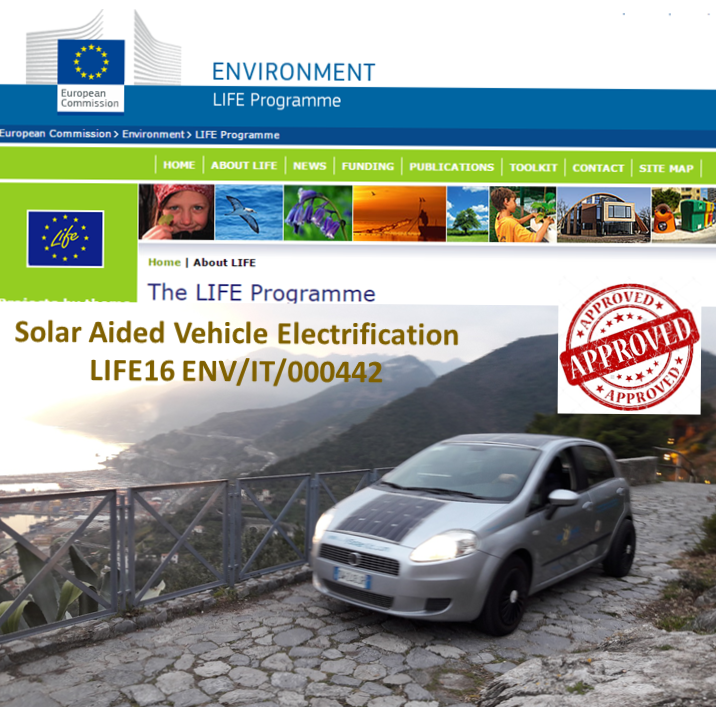 A very important step toward the success of the HySolarKit project has been achieved, with the approval of the proposal SAVE (Solar Aided Vehicle Electrification), within the European Program LIFE. Available the project synthesis and the evaluation synthesis. The project will start on September 2017. Keep in touch!! According to the Academic Ranking of World Universities, in 2016 the University of Salerno is one of the two italian universities in the TOP 100 world universities, with Polytechnic of Milan, for Engineering/Technology and Computer Sciences. Details here. The project HySolarKit, submitted to SME Instrument Phase2 of Horizon 2020, has been awarded with the "Seal of excellence" by European Commission. This means that our project has passed all stringent Horizon 2020 assessment thresholds for the 3 award criteria (excellence, impact, quality and efficiency of implementation) required to receive funding from the EU budget Horizon 2020. According to a recent European policy of building synergies between Horizon 2020 and the European Structural and Investment Funds, the holder of a Seal of Excellence can then approach alternative funding sources (regional, national, private or public) and present the certificate as a label of a high-quality project proposal. The hybrid-solar car developed at the University of Salerno has been chosen as a prototype of ecological vehicle in the movie Asphyxia, directed by Alessandra Angeli. The movie, recently presented at the Festival de Cannes 2016, has been selected to the FILM-COM Down Under in Perth. Will next step be a real solar trip to Australia? Federica Pozzato and Alessandro Franzese, students of "International Management" at Bocconi University in Milan, within a stage at the Indian Institute of Management di Calcutta, have selected HySolarKit as a case study for the final project of the course of "The Economics of Corporate Sustainability". Details on the blog. HySolarKit is candidate to "Assiteca Crowd Startup Showcase", a new contest for Startups. The winner will be assisted in collecting funds by means of "equity crowdfunding", making it possible to potential investors to share the results of our project. A click on this link will help us in candidating our project. The recent events involving VW group have drawn large attention on vehicle emissions control. This topic will be discussed on Sunday September 27, at 8.40 AM, within �Si pu� fare� on Radio24, with prof. Gianfranco Rizzo of the University of Salerno, promoter of the project HySolarKit. After the successful participation to Phase 1 of �Horizon 2020 SME Instrument�, the project HySolarKit goes toward Phase 2 with new partners: in addition to the promoter eProinn, a spin-off company of the University of Salerno, Actua, LandiRenzo and CiaoTech - PNO Group, also Solbian, an innovative company producing flexible photovoltaic panels, joins the project. The magazine Platinum, distributed with "Il Sole 24 Ore", has published an article on the project HySolarKit in the special issue for EXPO 2015. The article is available in Italian, English and Chinese. The special issue of the magazine is available in Italian and English. The project HySolarKit has attracted interest for potential application in Malta. The project has been presented at local institutions on July 2nd, 2015, during a visit to Malta Enterprise, MCST and Transport Malta. The projects HySolarKit has received a grant within the SME Instrument of Horizon 2020 (Phase 1). The project has been submitted by eProInn, spin-off of the University of Salerno, with the partnesrhip of Actua and LandiRenzo, and with the support of CiaoTech of PNO Group. The project HysolarKit is described in the issue of March 2015 of the Newsletter of IEEE AP/ED/MTT North italy Chapter, pag.3. The newsletter #22 of the project HySolarKit has been sent on January 7th, 2015, to about 13000 contacts. After a meeting in Beijing on November 25, 2014, the RongTong Science and Technology Industry Group has decided to support the development of a prototype of the kit for the Chinese market. Our staff will participate in the China Italy Innovation Forum in Naples, October 14, 2014. Gianfranco Rizzo will be in China from July 14 to 18 to give a short course on "Energy management of conventional and hybrid vehicles" at the Tsinghua University in Beijing, within a bilateral agreement with the Dept. of Industrial Engineering of the University of Salerno. Contacts with chinese investors for the project HySolarKit are also planned. Support HySolarKit project for the uPStart award, through voting on this page. Until the 13th of June. HySolarKit has been selected from INTESA San Paolo Bank to concur to Start Up Initiative, in Milan. Four-junction concentrated solar modules are approaching the target of 50% efficiency: details at this link. Saturday May 10, at 5 PM, the project HySolarKit has been presented at the Italian TV RAI2, for "Sereno variabile", with Osvaldo Bevilacqua. Available the podcast of Fabiana Bisulli interview from Radio CAPITAL to Gianfranco Rizzo for the project HySolarKit, went on air on SATURDAY 14th DECEMBER. In ITALIAN. 28-29/11/2013 - During the TechnologyBiz in Naples, the project HySolarKit has been presented to the CNR president Luigi Nicolais and the president of Campania region Stefano Caldoro. 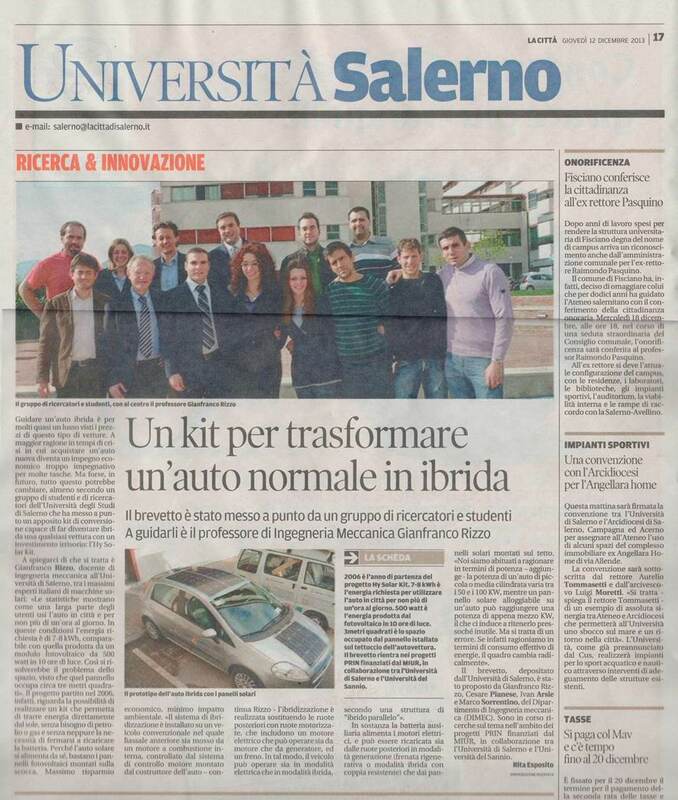 Talking about us on the web site Buonenotizie.it: HySolarKit: the italian kit to transform a conventional vehicle into an hybrid solar vehicle. Ten questions on the use of solar energy for cars. An educational book of Gianfranco Rizzo, with a preface Roberto Vacca (info) (in Italian). A large article di Rita Esposito on HySolarKit project on the issue of 12th December 2013 of "La citt�"
An updated review on the project HySolarKit has been presented at the prestigoius Accademia dei Lincei in Rome. The poster is available at this link. There is an increasing interest worldwide in the applications of photovoltaics to cars: more than 9000 downloads have been registered for the chapter on �Hybrid Solar Vehicles�, (by G.Rizzo, I.Arsie and M.Sorrentino). 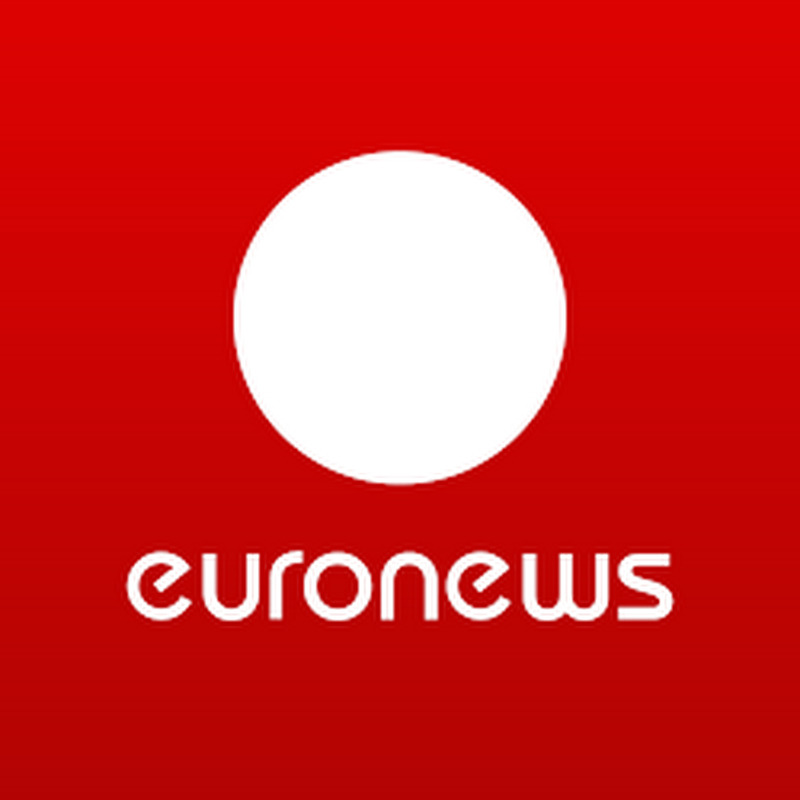 The project HySolarKit is on EuroNews. 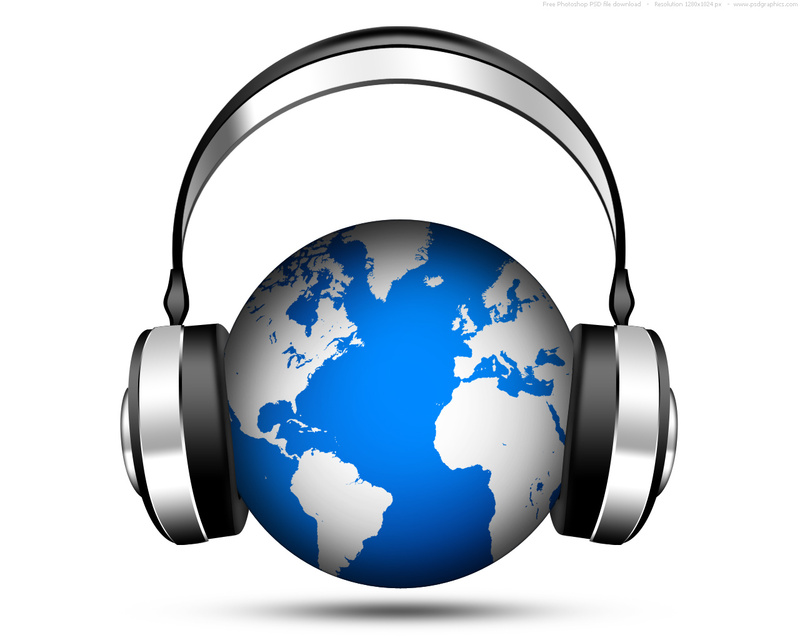 In Italian, English, Deutch, French, Russian, Ukrainian, Spanish, Hungarian, Portuguese, Greek, Turkish. Fill out your e-mail address to receive our newsletter! You will receive an email to confirm your subscription. Awards and achievements at this page. 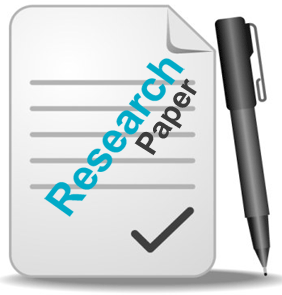 Many papers published by the researchers of eProLab on hybrid solar vehicles on and on solar hybridization of cars are available at this link.